Yesterday I attended the first of the 2016 Sandars Lectures delivered by Professor Anthony Grafton at Corpus Christi College, Cambridge, which this year (in honour of the 600th anniversary of Cambridge University Library) focus on early modern Cambridge historians. The first lecture, appropriately enough, concentrated on John Caius (1510-1573), who in addition to being the re-founder of my old college (in 1557) was one of the most important East Anglian Catholics of his generation. Grafton’s lecture tackled a central problem in the biography of John Caius: namely, why his Historia Cantabrigiensis Academiae (1574) has become a notorious example of extravagant historical fantasy (‘a farrago of invention and credulity’ according to Christopher Brooke) while many of his other works displayed an advanced level of understanding of the latest Renaissance Humanist methods of history and research. Grafton drew attention to Caius’ abiding interest in philology; he was one of the few philologists working in England in the 1560s, when he was building up the newly re-founded Gonville and Caius College as ‘a Humanist machine for character formation’. The College’s celebrated three gates served as an architectural representation of the undergraduate’s progress from Humility to Virtue and finally to Honour, as he passed out of the Gate of Honour to receive his degree in the Senate House (something I have been privileged to do three times, although a porter once surreptitiously let me out of the Gate of Honour when I was still an undergraduate). In other ways, however, Caius did not fit the image of the enlightened Renaissance scholar, and he dealt with disobedient students by beating them and putting them in the stocks. John Kays (for whom multiple surname variations can be found in the sources) graduated at the head of the list of BAs in 1532-3 from Gonville Hall, ‘a small, clerical establishment’ with a longstanding association with the county of Norfolk (Kays was from Norwich). It may have been in Italy, whilst studying at Padua, that Kays came up with the idea of adopting (like many scholars of the era) a convenient latinisation of his surname. At Padua Caius distinguished himself by editing the works of Galen. Later, at Basel, he formed a lasting friendship with another Humanist scholar, Konrad Gessner, who apparently inspired him to write his work on English dogs. Returning to England, Caius not only re-founded Gonville Hall as Gonville and Caius College in the reign of Queen Mary, but also served as President of the Royal College of Physicians and introduced Vesalian anatomical demonstrations to England. However, Grafton argued that Caius was a devotee of the medical tradition of Thomas Linacre rather than an innovator like Vesalius. For Caius, ‘What was needed was not so much better anatomy as better philology’, and in 1555 he lampooned a physician who was unable to decline corpus correctly as unfit to practice. In other words, Caius believed that it was by producing better editions of Galen rather than by any new investigation that medicine would be restored to its pristine purity. Caius took his devotion to the ancient medical writers to such an extreme that according to Thomas Muffett, on his deathbed in 1573 Caius brought in two wetnurses and sucked on their breasts in an effort to keep himself alive – following an ancient prescription. Caius led a dual life as a scholar and university administrator, but it was this latter role which led Caius to write his Historia Cantabrigiensis Academiae. In the sixteenth century, ‘Cambridge was sorely in need of a past’, largely because most of the University’s older documents had been burnt in front of Great St Mary’s Church during the Peasants’ Revolt of 1381. However, ‘strange and wonderful documents’ were created in the late fourteenth century with the purpose of establishing the University’s independence from the jurisdiction of the Bishop of Ely, in whose diocese the University lies. These documents were ‘serious fakes’ that served a very real and important purpose for the University. In the 1560s an argument concerning the antiquity of the University erupted between Cambridge and Oxford, when in 1564 a Cambridge orator informed Queen Elizabeth that Cambridge was older than Oxford. The Oxford orator Thomas Caius responded in 1566 with a Historiola of the University of Oxford, in which he claimed Oxford was the older institution. 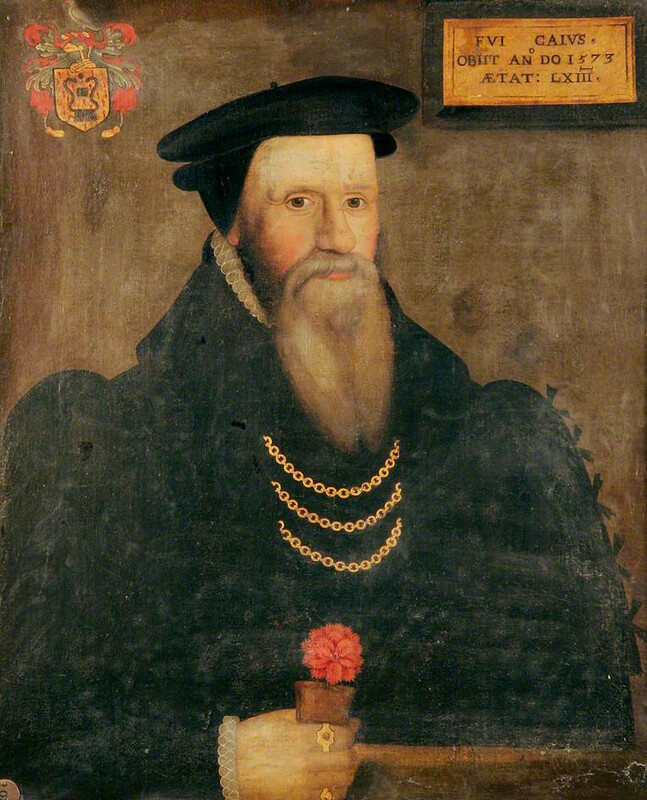 Archbishop Matthew Parker encouraged John Caius to vindicate Cambridge, which led to Caius’ Historia, published anonymously in London in 1574 ‘by a Londoner’. However, everyone seems to have known that John Caius was the author, and the book was not warmly received by the antiquary William Lambarde, even though he was a friend of Parker – Lambarde left it to ‘indifferent readers’ to judge the worth of the book themselves. John Leland’s verdict was more damning: ‘Truly I have never read anything more empty, more foolish or more stupid’. Grafton established that one of the main sources used by John Caius was a Historiola of the University of Cambridge written in the late fourteenth century by the Carmelite friar Thomas Cantilupe, which resembled the sort of fabulous narratives that might be told before a jousting tournament, along with charters forged in the thirteenth century from King Arthur and the seventh-century Popes Honorius I and Sergius I. Caius consulted copies of these documents contained in the so-called Black Book of the University. Caius knew that the Black Book itself was not particularly old, and that William Buckenham, Master of Gonville Hall 1508-10 and Vice-Chancellor of the University (who may well have talent-spotted the young Caius in Norwich) had added material to it. However, Caius defended his work, and Cantilupe’s Historiola, against the criticisms of Leland and others by claiming that he could bring forward the same evidence in any form his opponents demanded – even illuminated in gold. Grafton argued, intriguingly, that this statement of Caius was a reference to the richly decorated Liber privilegiorum et libertatum universitatis Cantebrigiensis presented to the University in 1590 by a fellow alumnus of Gonville Hall, the recusant antiquary Robert Hare of Bruisyard, Suffolk (c. 1530-1611). Grafton suggested that Caius may have seen and had access to Hare’s ‘new register’ (which contained copies of the documents cited in Caius’ Historia) long before its presentation to the University; Hare was ‘a friend and affiliate’ of Caius. One innovative feature of Caius’ Historia was his inclusion of a dense bibliography, although most of the books he cited existed only as manuscripts at the time. M. R. James traced Caius’ bibliography back to the massive collection of manuscripts collected by Parker at Lambeth Palace in the 1560s, which included not only the core of present Lambeth Palace Library but also the contents of the present Parker Library at Corpus Christi College, Cambridge, the Cottonian Library that is now part of the British Library and manuscripts in Cambridge University Library. John Strype tells us that it was Parker who arranged the printing of Caius’ Historia and that the Archbishop sent out presentation copies of Caius’ work, yet oddly Caius never mentioned Parker in the book. Caius’ preoccupation with philology as a foundation of history (as well as medicine) was shown by his appeal to the use of the word constat (‘it stands as established fact’) in a manuscript owned by Hare (Gonville and Caius MS 717) by ‘an author of uncertain name, but great authority’ in recording that King Arthur issued a charter to the University. It was the fact that the author of the manuscript used the word constat (showing the author’s own certainty) rather than any other considerations of plausibility that demonstrated the authority of the source. Likewise, Caius accepted as authentic and incontestable the claim found in another manuscript that nine doctors of Cambridge were baptised in the year 141 – even though this information was scrawled into the manuscript in a later hand. The credulity with which Caius composed his Historia contrasts strongly with the care he took in editing Galen, where he adopted the latest in Humanist editorial techniques – citing pages by their signa and even noting the exact date on which he consulted particular manuscripts. Caius may have learnt techniques like these from Angelo Poliziano in Italy, along with learning the latest in bibliographical scholarship from Gessner. He was one of the first Humanists to express the idea that a collection of data could be a thing valuable in itself, and a manuscript given by Caius to Gonville and Caius College library in which he commented on the order of the books of the Hebrew Bible shows that Caius was at the forefront of Hebrew scholarship in England at the time. Caius knew that the location and provenance of manuscripts mattered – he was a ‘library rat’ who enjoyed recounting his experiences of working in different libraries around Europe, and he advocated the establishment of better research libraries in England. To him we owe the earliest printed catalogue of books in Cambridge University Library (in the Historia), and he was an ‘antiquary in a serious way’ with a developed awareness that institutions change over time. He mourned for the austere Cambridge of his youth, and yet in the Historia Caius seemed to lack completely any sense of anachronism. Caius was an incisive historical critic, but he had a blindspot when it came to the sources most important to him – those that could establish the antiquity of the University of Cambridge. Grafton argued that Caius was not ‘silly or crazy’; rather, he was following established practice in his own time. Notaries had procedures to ensure that copies of documents were accepted as being as authoritative as the original, and such a process had taken place at Great St Mary’s Church in 1419 when the Papal Notary Thomas de Ryhale verified the charters of the University – including those by King Arthur and seventh-century Popes. For Caius, the veracity of documents was ‘less about content than process’. Caius, as an institutional historian and annalist, saw every event in the University’s history without historical breaks, ‘flattened out and continuous’. He believed in reproducing what was in the archive, even if it was wrong, because he was a believer in documents and a believer in institutional continuity. Caius loved tradition, advocating the minute observance of all college and university customs, but his love of tradition also extended into the religious sphere and would get him into trouble, such as when it was reported to the Bishop of London that Caius retained ‘massinge abominations’ in his college under the cover of ‘college treasure’. On 13 December 1572 the vestments and ornaments were burnt in the college court over the course of three hours, and what the University authorities could not burn they smashed with hammers. Grafton has difficulties accepting the idea that Caius was a crypto-Catholic, on the grounds that he was so friendly with Parker, and his guess concerning Caius’ religious convictions was that Caius was ‘a strange sort of mixture of Erasmian Christian and Protestant antiquary’. This was the one part of Grafton’s analysis with which I cannot agree – after all, one could argue equally that because Caius was close to the recusant antiquary Robert Hare he must have been a Catholic. The evidence of the vestments found in the college in 1572 speaks for itself; Caius founded his college in the heady Catholic Humanist days of Marian Cambridge in 1557, and in my view he was essentially a trans-European Catholic Humanist in the mould of Reginald Pole. Overall, Grafton made a convincing case for Caius the historian as a coherent figure, who showed that ‘institutional annals could turn in Caius’ hands into the strangest and most extravagant of polemics’. This entry was posted on January 27, 2016 by jacobite.